Ever dreamed of travelling the world to teach snowboarding or skiing for a living? Fancy a break from the nine to five, or need change of direction? Perhaps you just want to add another string to your snow cannon? SnowSphere Magazine hooks up with Rupert Taylor, founder of NONSTOP Adventure. By following his own passion for snowboarding, Rupert and his team now take other people's dreams of living the endless winter and turn them into realities. My name's Rupert Taylor, friends call me Roop. Snowboarder, surfer, inactive environmentalist (I try, but there's more coming), traveller, somewhat reluctant businessman and founder & part owner of NONSTOP Adventure. What exactly does NONSTOP Ski & Snowboard do? 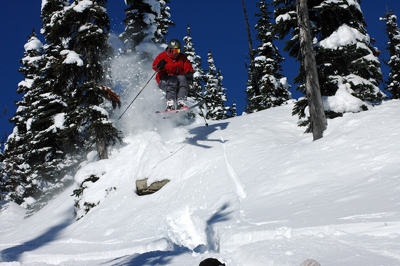 We provide ski and snowboard camps in Canada. Our trips focus on improving people's riding and all-mountain skills (avalanche, winter survival, emergency first aid etc) and most of our courses lead to instructor qualifications allowing people to go on and teach at resorts around the world. Trip lengths vary and we currently offer 2, 3, 6, and 11 week courses. We organise almost everything involved in the trip (flights, accommodation, lift passes, meals, etc) so that our participants can fully focus on improving their riding and just enjoy shredding the Canadian powder. How did you get the idea to start NONSTOP, and when did you launch? We launched NONSTOP four years ago in January 2002. I was doing a season in Fernie, BC (Canada) working as a snowboard instructor and figured it was the perfect mountain and community to offer long-term instructor training programs. I'd done a similar program in Quebec after I left school and although I had an awesome time, the riding in Eastern Canada is pretty limited so I saw the potential of offering courses in the Rockies. When did you start snowboarding, and where was your first trip to? Like many riders, I skied first and was lucky enough to be taken on regular ski trips by my folks. 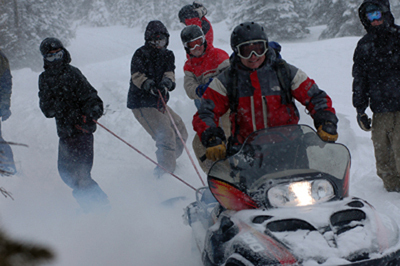 Twelve years ago we went to Norway where the terrain was limited and the snow as hard as nails. Me and my sister got bored so we rented boards, hard boots, and took a lesson. As any rider knows, once I'd linked my first few turns it was impossible to go back. Riding soon became the focus of my life and I spent the rest of school dreaming of doing a season and working in the snowboard industry. Why did you decide on Fernie to set up shop? Were there any other close contenders? Fernie was the only contender. A few friends wondered why I wasn't starting in Whistler as they hadn't heard of Fernie before, but it was obvious to me that Fernie's future was bright. I'd experienced day after day of perfect powder throughout the season, and people were saying it was simply average! The locals were confident that they lived in the best ski town in North America. Many of them had spent time working and living in Whistler and had all moved to Fernie for the dry light snow, laid back atmosphere, empty runs, and steep terrain. The cost of living there is much lower too, so setting up the business was more realistic than getting started in a well established resort. What problems did you incur when trying to set up the company? Morale & funding - we very nearly considered giving up in our first year. We had started marketing in April and had a booking within a week. We thought "awesome, this is going to be super easy." However the months flew by, we eagerly checked the post each day but there were never any booking forms. Then in August our one and only customer called us to cancel! We were down to zero and felt really despondent. However we were lucky enough to get an article the The Times (a British Newspaper) in late August and it just kicked things off…we managed to get 40 people on our first season - twice as many as we'd hoped for. The international nature of the business has always been tricky. Trying to work with both Canadian and UK times as well as effectively market in the UK, while overseeing operations in Canada was hard. However over the years we've built up a great team of staff both in the UK and in Canada. And finally trying to keep my personal life separate from work has been one of the hardest aspects of working for myself. If you start your own company you have to give 110% all the time. You never stop thinking about work, and when you leave the office you can't switch off. I've definitely sacrificed relationships because of work but I have no regrets…the lifestyle is worth it. Was there ever any pressure from you parents to get a "proper job", instead of setting up NONSTOP? My dad always wanted me to be an accountant. However when he realised I was only interested in snowboarding he supported my decision to do seasons and has backed me and NONSTOP since the beginning. You split your time between London and Fernie. Talk us through a typical working day in winter, and a typical working day in summer? During the winter I spend about 2.5 months in Canada and I make sure I'm around at the beginning and end of every course. A typical day would involve waking early, normally around 6.30am, calling the UK office to check all is running smoothly, answering e-mails, updating websites etc. Then breakfast with our clients before heading up the mountain to join one of our lessons. Riding the chair, sharing powder days or sessioning the park is the single best way of getting to know our clients and enables me to find out why they chose NONSTOP and what their aims for the program are. I normally spend the afternoon working in the office before joining the group for supper in one of the local restaurants. Some week nights we organise events such as snowboard tuning workshops, or avalanche theory courses which I'll attend or alternatively I'll join friends, clients or staff for a few beers. It's a super fun lifestyle but also really hectic. When I'm in London I work in our Clapham offices and am responsible for communicating with the Canadian teams, planning for the next winter, developing new programs, preparing our brochures and websites, managing our UK staff and assisting with marketing and sales.